Rose Slots is a unique platform that strictly focuses on mobile gaming. this does not mean that you cannot enjoy Rose Slots on your PC. However, the platform clearly takes advantage of the fact that most players spend more time on their phone or tablet than on their PC. As a matter of fact, it is more convenient. This is a very huge advantage since fun should not be restricted by location or device. As a result, Rose Slots kicked off its mobile slots UK just a few months ago. Of course, there has to be a very strong partner to handle other logistics. So far, Rose Slots has teamed up with one of the finest providers of iGaming solutions. The platform is managed by the Alderney-based Jumpman gaming. Hence, it enjoys full license by the government of Alderney and the government of UK. Rose Slots is a huge fan of the FIFA 2018 world cup currently taking place in Russia. If you love football, you’d be aware of some key dates for some key fixtures. Rose Slots is taking advantage of these dates to offer football lovers the “Football Fever”. On each selected date, fund your account and receive some extra spins on your favourite games. Currently, Rose Slots offers as much as 10 extra spins to players who make deposits on any of these selected dates. However, there are many terms that you need to watch out for. Rose Slots require that all winnings from the extra spins be wagered a massive 65 times. In addition, the maximum conversion per spin is $8. In total, the maximum conversion is $250. Anything higher than this will be removed from the player’s account. Rose Slots offers some of the best mobile slots. Mobile in the sense that you enjoy 100% immersive experience on your mobile devices as you would on your PC. The platform adopts the latest tech to provide users with an enhanced mobile experience. enjoy playing fluffy favourites as well as several other classic slot games. Enjoy the collection of jackpots as well as Bingo games on Rose Slots. If you would like to try out other slot sites, please have a look at our complete new casino sites slots listing here. There is nothing more than a special reward for every task that you complete. Rose Slots makes the platform a lot more fun. In addition to enjoying a massive collection of games, players also get to participate in selected tasks. When you do, there are several rewards awaiting you. For each level that you unlock, Rose Slots offers players some extra spins. The higher you go, the more you get the chance to spin the mega reel. Also, you need to collect 10 trophies to complete each level. Since rose symbolizes love; care; affection, it is very obvious that Rose Slots care so much about their players. As you journey through Rose Slots, there are tons of rewards and promotions up for grabs. Rose Slots offers new players the chance to get some extra spins on Starburst. There are 500 extra spins up for grabs. In addition, they also offer Amazon shopping vouchers. All these are available when you make your first deposit. Upon meeting up with the minimum deposit requirement, you will automatically get a chance to spin the mega reel. In the end, the outcome is really worth the try. Furthermore, Rose Slots also offers so many other promotions. You could enjoy a massive 31 days of double cash back or join the Pizza club to enjoy unlimited benefits. With all that has been said so far, it seems that everything is red on Rose Slots. The platform offers so many promotions and some of the best collection of games. However, there is nothing ‘rosy’ about their wagering requirements as well as their bonus terms and conditions. Currently, Rose Slots has a wagering requirement of 65 times. That is about one of the highest in the industry. Let’s say you make a deposit of $50. If after spinning the mega reel you get a bonus of $100; it means that you must wager $100 x 65+ $50 = $6550. Now, that’s a lot of money to meet up with. In the end, if you fail to meet up with this requirement within the stipulated period, the bonus will be revoked. It is also important to note that not all games contribute to the wagering requirement. 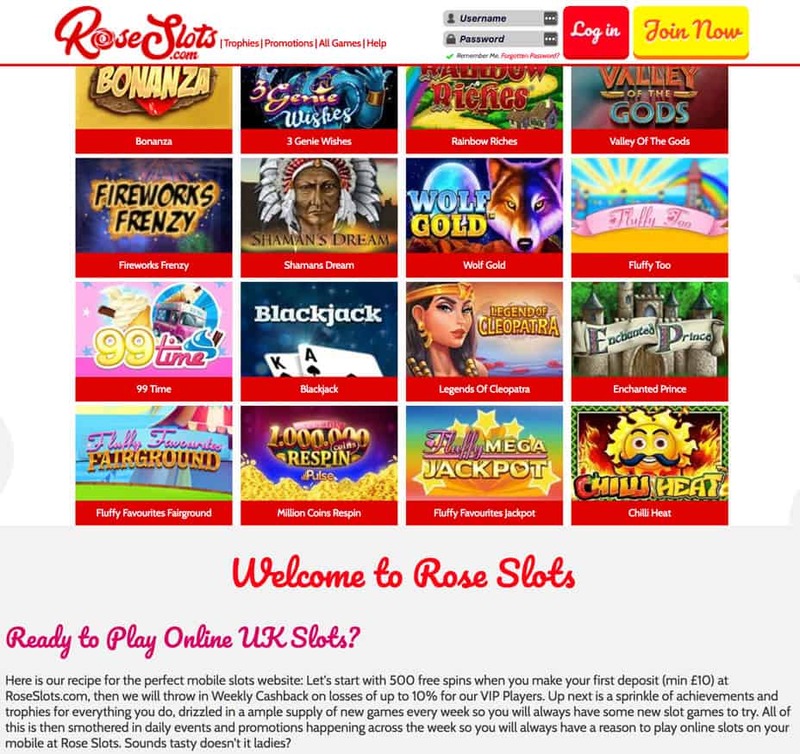 Rose Slots only offers financial transactions in GBP. That’s not a plus if they are to accommodate players from other countries. The platform features several deposit options like PayPal; VISA; Maestro and Paybymobile. Players are free to add as much as three different payment options. Also, these options are available for withdrawal except for paybymobile. Rose Slots impose deposit limits for all players. The limit is $5000 each day; $35,000 per week and a massive $100,000 monthly. Personally, I don’t see this as any restriction especially when compared to the limits set by other platforms. Rose Slots has the advantage of allowing two withdrawals at a time. However, you cannot place any request for withdrawal within 72 hours of your first deposit. In all, all requests take up to 3 days before it is processed. In the end, withdrawal takes between 3-5 days to reach your account. Support is available but you must have to reach out first. You can do this by clicking on the “support button” just down the page. The first information is the FAQ which gives an overview of Rose Slots. It contains information as regards what to do; what not to do; how to do things and many more. Afterwards, if you still have questions bothering you, there is a team waiting on the other side to help you. Kindly send an email to support@roseslots.com. You will receive a response within 24 hours. Also, you can reach out by hitting the live chat button. However, you have to log in to your account before you can use this option. That’s a cool idea so as to give priority to registered players. Rose Slots great casino site www.roseslots.com has its rosy side. These include a huge collection of games; great payment methods; several generous promotions; secure and fast payment; and round the clock support. The platform features all the good sides of a perfect online casino. However, they have their pitfalls as well. One of the major downsides of Rose Slots is their huge wagering requirement. Of course, once it has to do with money, it becomes a very big issue. Another area of the Rose Slots that needs attention is the speed of payment. So far it takes as much as 3 days to verify payment requests and another 2-5 days before the payment reflects in the player’s account. That’s a lot of time but in the end, you surely will receive your payment.